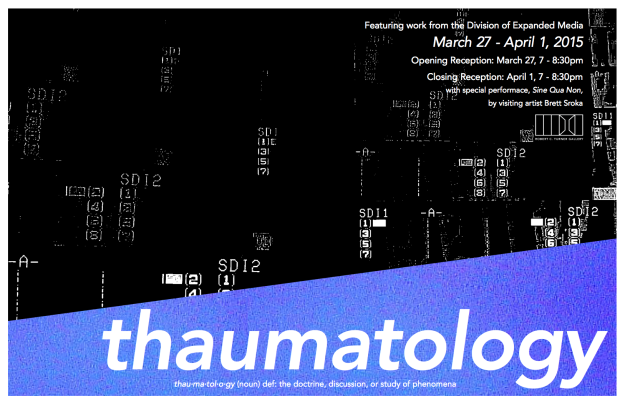 Thaumatology opened on Friday, March 27th. The show is a collection of work from the students of the Division of Expanded Media at Alfred University. With a variety of artists and media including Design, Print Media. Video. Sound and Interactive art. View of Zihao Chen's Laser cut Wood block Prints from above. Professor Gerar Edizel viewing Tin Liu's Photo Etchings. Grant Akiyama, second from left co-curator at opening. From left to right, Joseph Scheer Professor of Print Media, Zihao Chen senior student, Emil Schult Randal Chair. Two channel video projection on handmade fibrous paper. Students and Faculty at the opening.